I don't know about you, but around my house and studio, there are several areas informally designated for "works in progress." I think I have an advanced case of "Too Many Ideas," because the space designated for artworks, or art materials, or possible art projects, too often suspiciously seems to displace that designated for human occupations. End tables hold stacked containers of tiles on their way out to the studio; the sofa is covered in books and sketch pads, with a small corner open for sitting (usually claimed by the cat); a large worktable at one end of the living room is occupied by several half-finished projects, picture frames, and supplies. In the studio, two half-finished sculptures have occupied a corner, under plastic, for several years, waiting on a time when I have the time to work on them again. My studio table, in addition to active working projects, also includes a string of partially completed projects or project materials perched around the edges, such a few plates to hold photos, a 6-inch wooden cube to put faces on, and several 5-by-7-inch canvas boards to cover with mosaic/paint combinations. The current winner of "studio project most likely to be completed any time soon" is this one featuring two cranes and divided into four sections, which, when finished, will show the four seasons. The problem with studio projects is that progress slows way down during colder weather because the studio is not heated. Heat I can take, but I'm a total wuss in the cold. In the house, where my mosaic activity moves in cold weather, I'm hampered by not being able to do liberal cutting, since (a) I have a cat, and (b) I go around in bare feet or socks. So I have to be really, really careful when cutting glass, which means I'd rather work with tiles that don't require extensive cutting. Recently I've been working on some interesting projects that have a singular perk: I can work on them while watching TV in the evenings. I love this, because I seldom just sit and watch - I'm always doing something else, such as sketching or reading - so why not work on a mosaic project? 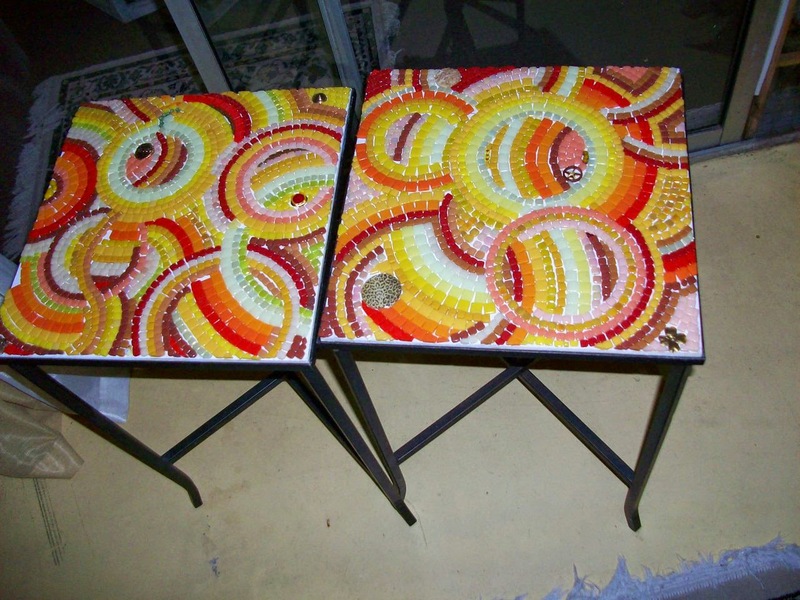 A couple of years ago, a designer friend gave me two wrought iron side tables with inset tops - perfect for mosaic tabletops. I had pieces of wood cut to fit and primed them, but then the tables sat in storage for quite some time. But when the weather turned chilly last month, I hauled them out, plunked them down in front of the TV, brought out some lovely orange and yellow tiles I had left over from another job, and started playing with circles. 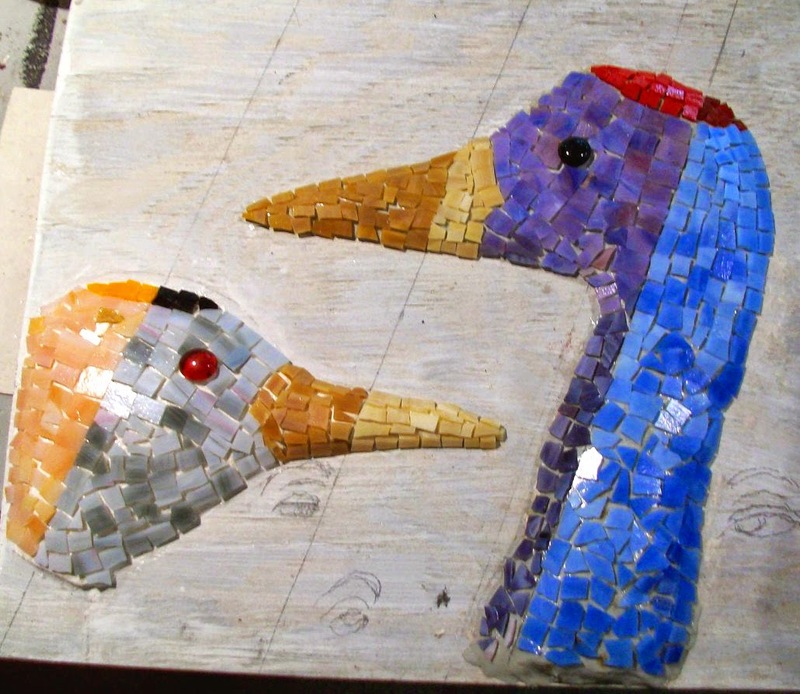 Here's the work on progress; I just need to fill in a few spaces; then they will be ready for grout. I couldn't help myself - I inserted some funky jewelry and other found objects here and there. I'll post pix of the finished tables after grouting.